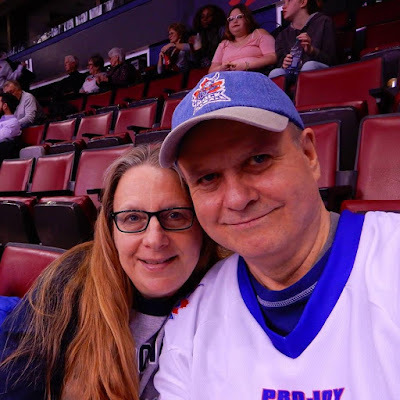 Tonight Teena and I were at the ACC to watch the Toronto Rock take on the New England Wolves. It was a battle for first as the Black Wolves came in with a 3-1 record with the Rock just a game behind at 3-2. The Rock though started the season with two losses and currently are on a three game winning streak. As usual Scotty Newlands sang the national anthems. Former Olympians and some of the Toronto Argos were on hand for the ceremonial face off and brought along the real Grey Cup. At the half the Rock led 10-7 and it was a close game. Nick Rose was outstanding in goal and kept Toronto ahead. The Toronto Rock Cheerleaders put on a couple of great performances. Toronto outscored New England 4-2 in the third quarter to be up 14-9. That was as close as New England would get in the game as the Rock put in 7 goals in the final quarter with Nick Rose shutting them out to make the final 21-9. Iggy Rock is always popular. No we didn't win this but suspected that a fellow twenty rows below us did. Tim and Gillian wave the Rock flag during the victory lap. Most of us love to see our team win an exciting game with a last minute goal but tonight was fun and just a loud celebration all through the final quarter. In a battle for first, it's great to see your team dominate. The Rock have now scored 82 goals in their past 4 games and are looking like a powerhouse. Next Saturday night the Toronto Rock take on the Calgary Roughnecks and of course, Teena and I will be there.